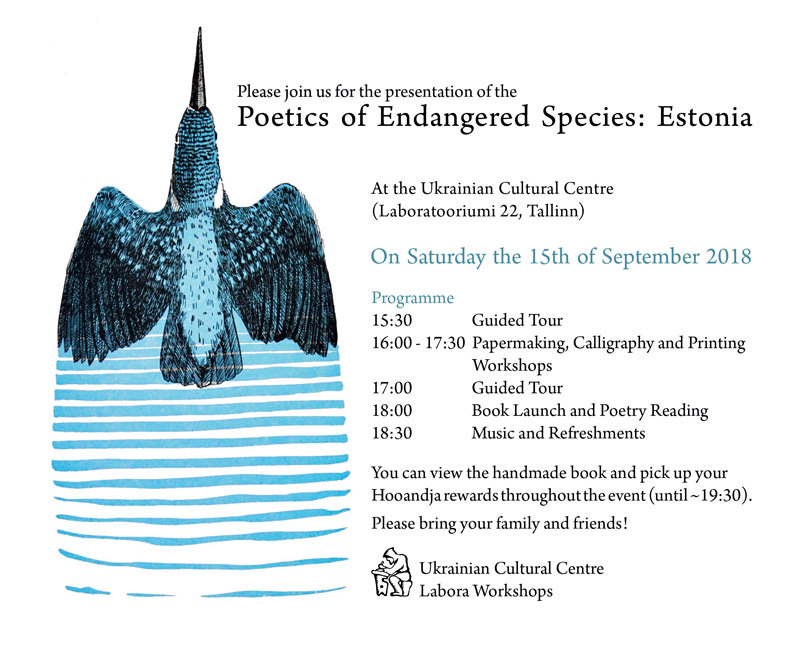 On Saturday, September 15, 2018, Tallinn’s Ukrainian Cultural Center and its Labora Workshops will present their new book known as the Poetics of Endangered Species to honor Estonia on her 100th anniversary and to celebrate the diverse beauty of her flora and fauna. To mark the occasion, the Center will host an open house on its grounds at Laboratooriumi 22 in Tallinn’s Old Town. In addition to the book launch and a poetry reading, the program – which will start at 15:30 and last until around 19:30 – will feature guided tours as well as workshops on papermaking, calligraphy, and letterpress printing so that visitors can discover how the Poetics of Endangered Species was made. People will also get a chance to see one of the handmade originals of the new book. The Poetics of Endangered Species first came to be after a fateful 2006 meeting between Ukrainian Cultural Center founder Anatoli Ljutjuk and Estonian poet Timo Maran where they decided to work together to create a new book. When the pair were joined by Antoli’s son Nestor Ljutjuk as illustrator and Estonia’s master calligrapher Heino Kivihall, then the creative team was complete. Various paper makers, translators, editors, and project managers rounded off the production team. Thanks to the help of Eesti Kultuurikapital and MEIS (the Integration Foundation), the Center published a facsimile edition of the first Poetics of Endangered Species in 2007. The book was a success and quickly went out of print. Fast-forward to 2018: Anatoli and his friends decided that the time was right to produce a new and improved version of the Poetics of Endangered Species. And this time, they decided they would try to crowdfund it via Hooandja. Their campaign was a success, gaining 275 supporters and raising almost 9.500 Euros – or almost 20% above their expected production costs. With so many supporters waiting to see the results, Anatoli and his team set to work to make the books to accompany Timo Maran’s poems – both those from the original edition as well as the new ones he wrote especially for the new book – each written from the point-of-view of a specific Estonian animal or plant. While Nestor Ljutjuk worked on his new illustrations and new calligraphy master Tatiana Iakovleva faithfully transcribed each poem, Tamara Soboleva pulled the hundreds of sheets of handmade paper needed to make the handmade copies of the book. Each sheet – containing tiny inclusions of non-endangered Estonian plants – was also tinted in natural shades of yellow, blue, brown, or green to give each page in the book its own individual character. As always with handmade paper, no two sheets are ever the same. You can see this if you visit Labora’s Shop on Vene 18. Once Nestor and Tatiana’s work was done, Nestor took over as the book’s artistic editor to join these two halves into a single whole. From his computer assisted design work came the polymer plates which master printer Hannah Harkes used to handprint seven copies of the new Poetics of Endangered Species. One of the originals was then chosen to serve as the master template for the facsimile edition. It was scanned and sent off to the Tallinn Book Printers to produce the additional 500 copies of the book. During the presentation on September 15th, the National Library of Estonia and the Tartu University Library will receive their handmade versions of the book donated by sponsors. Hooandja supporters will be able to pick up their facsimile copies – or any other items they may have ordered including a special bookmark, postcard, dustjacket, or even a poster. Others who attend the event will get the chance to buy their own copies of the new Poetics of Endangered Species. And everyone will get a chance to meet the creative team – as well as those who worked quietly behind the scenes – who made the publication of this book possible. Please feel free to join us on this great day to celebrate Estonia’s natural diversity!